CAMPBELL RIVER AND SAYWARD – Here is a chance to learn more about the new $274.5 million, 95-bed Campbell River Hospital and $331.7 million, 153-bed Comox Valley Hospital. The North Island Hospitals Project invites all community members to attend a session to find out how the new hospitals will support your health care needs. Construction of the new Comox Valley Hospital parkade will require a temporary closure of the public walkway along the hospital project’s north perimeter. The construction contractor, Graham, has maintained the walkway during excavation of the parkade footprint, but the walkway will be temporarily closed in August during construction of the parkade and a nearby retaining wall. The walkway is anticipated to reopen in September 2016. 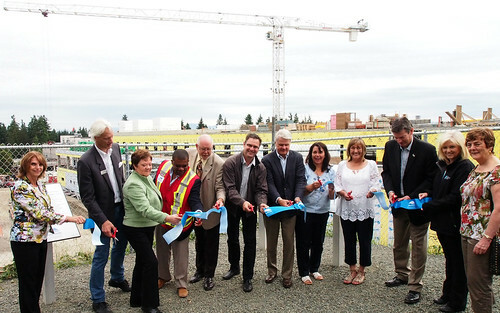 COURTENAY/CAMPBELL RIVER – Local residents will be able to stay informed and up-to-date on construction progress for the North Island Hospital Project as two new interpretive centres opened today in the Comox Valley and Campbell River. Here is a chance to learn more about the new $274.5 million, 95-bed Campbell River Hospital and $331.7 million, 153-bed Comox Valley Hospital. The North Island Hospitals Project invites all community members to attend a session to find out how the new hospitals will support your health care needs. Another expanded round of North Island Hospitals Project community information meetings are slated for early June. Held every quarter, the meetings are usually scheduled for early evenings. This time, in an effort to make the meetings more accessible, afternoon sessions have also been added. Tuesday, June 2nd, from 3:00—4:30 p.m. and from 7:00—9:00 p.m. in the Stan Hagen Theatre, Komoux Hall (K104), North Island College, 2300 Ryan Road in Courtenay. Check out our May 2015 NIHP Newsletter edition for information about construction progress, a visit to Queneesh Elementary School and upcoming community information meetings. The North Island Hospitals Project team is bringing its latest community information presentation to Quadra Island this month before returning to the Comox Valley and Campbell River with its quarterly information meetings in June. All three meetings will provide a chance to learn more about the new $274.5 million, 95-bed Campbell River Hospital and the new $331.7 million, 153-bed Comox Valley Hospital. Building the $331.7 million, 153-bed Comox Valley Hospital next to an elementary school is proving inspirational and educational for students as well as members of the North Island Hospitals Project team. It helps when your Queneesh School classroom has one of the best views of the Comox Valley Hospital construction site. That’s the case with students and teacher Anne Buchanan in the intermediate Montessori class including grades 4-7. The class has adopted the hospital project. The construction of the new hospitals in the Comox Valley and Campbell River is forging ahead, on time, on budget and on scope, says Chief Project Officer Tom Sparrow.